Banjo (Henry) Clarke was born around 1922 on Framlingham Aboriginal mission, located near Warrnambool in South-Western Victoria, Australia. During the depression Banjo moved to Melbourne with his family to look for work. Having very little formal education, Banjo learned about life from the Elders at Framlingham and from other Aboriginal people he befriended around Fitzroy in Melbourne. At fourteen he got work at a sawmill in Tynong North where the proprietor’s daughter taught him how to read and write. Many times I went to country towns and people looked at me like they didn’t want me there. I used to go into the hotel, ’cause I thought, That’s where you find where a job is. They’d all look and snigger at me. I’d walk out, pick me swag up and walk away, and they’d be there laughing at me walking away. Them people would have a go at you all the time, call you black this and black that. They are the unhappy ones because they’ve got unhappy homes. If they call you that, you still be their friend. Maybe one day you’ll help them. Banjo became a boxer at age 15, because he would hang out at the gyms in Melbourne. He traveled extensively throughout Australia, boxing for over 40 years. Back at Framlingham Mission, he met and married his wife of 40 years and they had 11 children. Banjo embraced the Baha’i Faith, because he felt that faith was the closest philosophy to that of his Aboriginal people. He constantly points to those aspects which he sees as relevant to all humanity, particularly in terms of our relationship with the land. 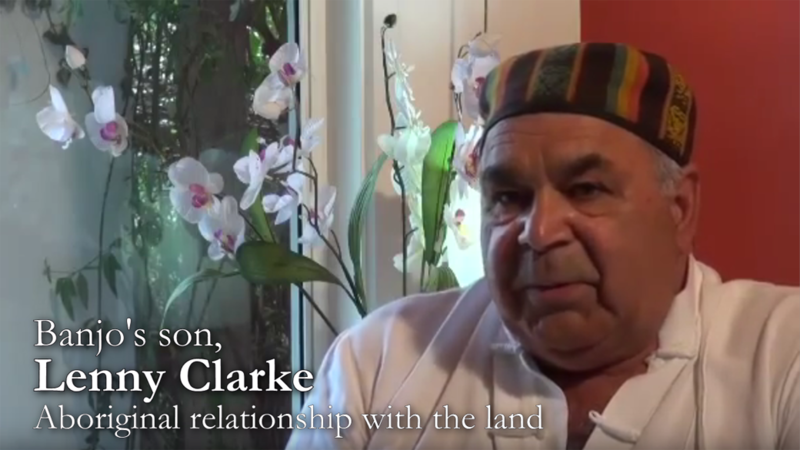 Banjo Clarke embodied the spirit of reconciliation in its most generous and forgiving form, espousing and living it long before it was given a name, long before it became fashionable. One didn’t talk to Uncle Banjo; such was his presence that one listened, because if you didn’t listen you could not absorb the wisdom and the spirit of this great man. I used to drive him to the shops twice a week, and we would stop near the Hopkins Falls, and we would discuss a lot and I would record him. We were doing that for 25 years. I first met Banjo when Baha’is were staying at my house – the Baha’i Faith being a religion that believes all humankind is one family. And Banjo said of that first meeting, We was drawn to each other. Aboriginals could see straight into our hearts. Banjo felt that the world was lost, and that he could make a contribution to the world finding its spirit again by telling the world about Aboriginal principles. And he actually saw the Baha’i Faith as Aboriginality for the modern world – he found the principles so very similar. 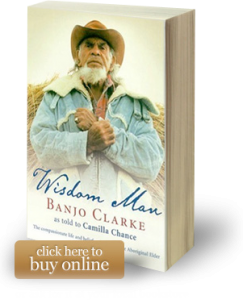 “An amazing and touching book – I could relate to all the Aboriginal beliefs. I felt like I had met him and his kids at the end of the book. It brought me to tears, really.